Thanks to the magic of the bullet train, we were able to take a day trip to Gyeongju (경주). Jieun's Dad gave us the last minute suggestion to get out of Seoul and see something different. I start with this first photo because photographically, it was my primary goal for the day. It's a place called Anapji (안압지) and we waited about 30 minutes after sunset for this shot. It's certainly not unique. You can see dozens of similar images on the Internet. But there's still something supremely satisfying about capturing my own version. Going back to the beginning, our day started very early. We were out of the hotel by 6am to catch the subway to Seoul Station (서울역). That's where we boarded our southbound KTX train. Though I didn't have much time, I ran to the front to snap this shot before departure. Soon we were half way across Korea traveling at speeds of up to 300 km/h. The ride to Singyeongju (신경주) took just over two hours. Every two cars had a dedicated WiFi signal to keep us connected. The train's ultimate destination was Busan (부산). I found this departure signage amusing. The KTX doesn't go directly to Gyeongju. They built a new station for the high speed line outside of Gyeongju and called it Singyeongju. It literally means New Gyeongju. We decided to start our day at Bulguksa (불국사). It's a famous Buddhist temple from the Silla Dynasty. There's a direct bus (#700) from the station to the temple. This is another photo you'll find all over the Internet. Being farther south, Gyeongju was warmer than Seoul. These delicious ice cream treats helped cool us down a little. Also, I was in awe of that truck advertisement. Eating ice cream out of a strawberry sounds incredible! Bulguksa features two large pagodas—Dabotap (다보탑) and Seokgatap (석가탑). The one in the following photo is Dabotap. I don't know much about pagodas, but I can appreciate the intricacy and sophistication of its design. 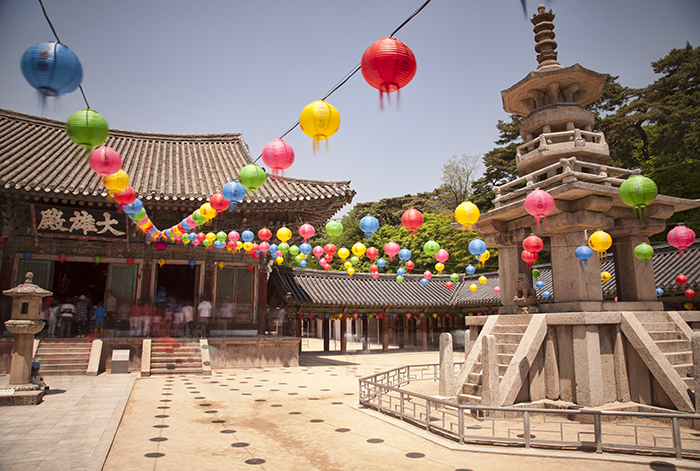 In comparison, Seokgatap is much simpler and similar to the pagodas you can find all over Korea. So it's no big deal that it was under renovation inside a large construction building. We took this self-portrait just outside the temple walls. If you're wondering, the decorative lanterns that you see everywhere were for the upcoming Buddha's Birthday celebration. After Bulguksa, we took another bus farther up the mountain to Seokguram (석굴암). It's an impressive grotto that houses an imposing Buddha statue facing the sea to the east. Before entering, we couldn't resist donating 1,000 KRW to ring the bell. Unfortunately, no photos are allowed inside the actual grotto. Instead, all you get is a picture of me being silly. The water coming out of this fountain was ice cold. I'm not entirely convinced that it was fresh mountain water, but it was certainly refreshing. They also had these separate water basins for washing your hands. This was also ice cold. Here are more decorations for Buddha's Birthday. I figured it's the perfect candidate for some HDR action. After Seokguram, we caught the buses back down the mountain and explored parts of Gyeongju on foot. This is an astronomical observatory called Cheomsongdae (첨성대), which apparently means stargazing tower. They charge money to enter the area even though as you can see, you get a pretty good view for free. 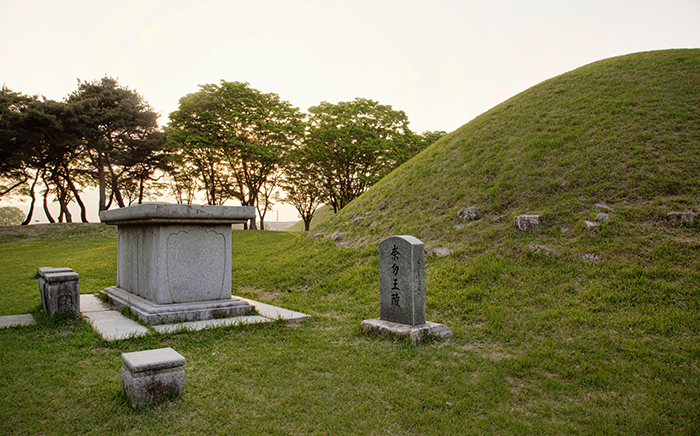 These strange mounds are the royal tombs of past kings. 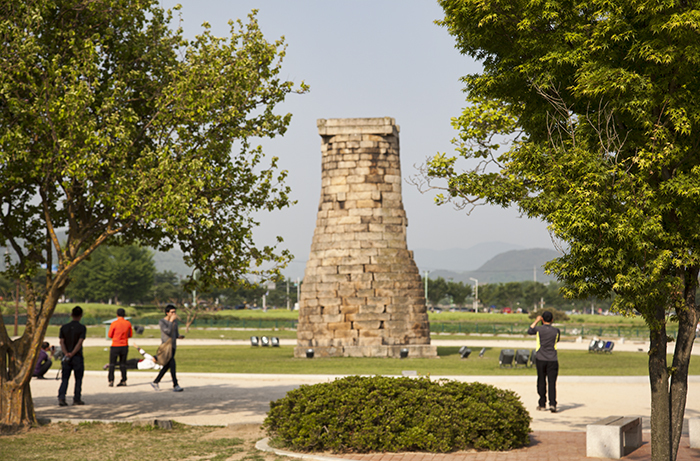 This is one of the reasons why they call Gyeongju a "museum without walls." There is rich history everywhere. Here is a closer look at the Royal Tomb of King Naemul. He was the 17th ruler of the Silla Kingdom and reigned for about 47 years (356~402). This photo turned out much nicer than I expected. I love the girls on the bikes with the Silla flower garden in the foreground and the spectacularly hazy sunset in the background. And this brings us back to Anapji. Like I said, it was my main goal for the day, so we made our way over and waited for the sun to set. I wasn't the only one, of course. There were at least a dozen other photographers there with tripods and remote shutter releases ready to fire. This is another angle on Anapji. I just happened to see this on the way out and quickly set up the camera and tripod for one last shot. I didn't have much time because we had a train to catch. Not wanting to take a chance on the late Sunday bus schedule, we caught a taxi back to Singyeongju for a measly 16,000 KRW (about $14 USD). That trip would easily cost more than $50 in overpriced Las Vegas. We arrived with plenty of time in advance of our 20:58 KTX back to Seoul. We were scheduled to arrive at Seoul Station around 23:07, which only gave us a few minutes to catch the last subway train that would get us back to our hotel. Spoiler alert: we made it. It was a long day. Time to try some Gyeongju traditional bread that we picked up. The one on the left reminds me of Filipino hopia. It's dense and filled with a red bean paste. The version on the right is lighter and fluffier. It's basically like two tiny pancakes sandwiching some red bean paste. Both versions are tasty, but I prefer the lighter one.